Microsoft Dynamics 365 pricing has been updated for 2018, effective April 2. This article will outline the changes and updates to Dynamics 365 licensing and pricing. For full pricing and licensing info. and an overview video visit our Dynamics 365 Pricing & Licensing page. There is a new sales license - Sales Professional, $65 per user/month. Microsoft describes this license as "core sales force automation". It enables a user to manage Leads, Opportunities, Accounts, Contacts, Activities, Quotes, Orders, Invoices, Marketing Lists and Sales Campaigns. Sales Pro. users do not have access to Competitors, Sales Goal Management, Territory Management, InsideView, Relationship Insights or Mobile Offline. The Sales Enterprise license is unchanged at $95 per user/month. You can mix & match Pro and Enterprise but not in the same tenant. Both Pro and Enterprise Sales licenses now have Case Management included. 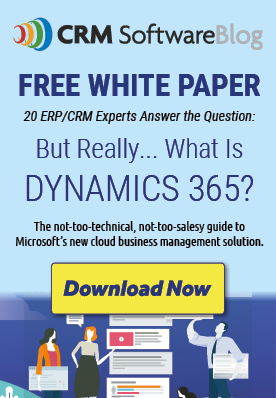 Microsoft has released their new Marketing application, Dynamics 365 for Marketing. It can be licensed as a standalone application or added to your Dynamics 365 subscription. It is included for customers who license the Customer Engagement Plan with at least 10 licensed users. Add it to your Dynamics 365 subscription for $750 per month. Each level has a max. number of contacts. The contact limitations are based on the total of both active and inactive contacts in your Dynamics 365 database. You can buy 5000 additional contacts for $250 per month. For a complete detailed look at licensing and pricing as well as an in-depth overview video visit our Dynamics 365 Pricing & Licensing page. I want to understand the Dynamics 365 for marketing licencing. The contacts that are taked in account for the pricing are the ones I have in my actual CRM Database? So, if I actually have 600.000 contacts (customers) I should pay near $30.000 per month?? ?